Thermal energy and heat are often confused. Rightly so because they are physically the same thing. The confusion comes from the usage of the term. Heat is always the thermal energy of some system. Using the word heat can help physicists to make a distinction relative to the system they are talking about. 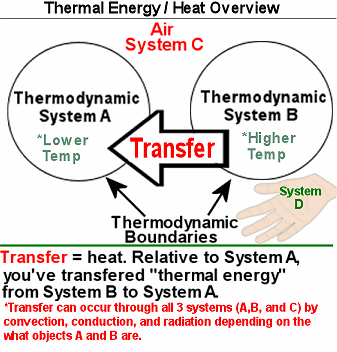 Heat: Term used to describe the transfer of thermal energy between two thermodynamic systems at different temperatures. Caveat: Although physicists and scientists do use this term - there is a colloquial quality to it. For students - talk to your physics teachers! Take a small piece of ice out of your fridge and hold it in your hand. The thermal energy content of your hand is higher then the thermal energy content of the ice cube. The atoms that comprise your hand are moving more rapidly then the atoms that make up the ice cube. Therefore, there will be a transfer of thermal energy from your hand to the ice cube. While this thermal energy is in transfer, it is called heat. This will cause the atoms in the ice cube to speed up while the atoms in your hand slow down. The increase in speed of the ice cube atoms changes the state of water from solid to liquid. This transfer of thermal energy will continue until an equilibrium is reached between your hand, the ice (now water), and the air in the room. Let's return to our overview from the homepage. If we put our hand into the box with the three systems (not touching the iron pieces), our hand becomes system D. We could then say that the heat from system B is warming our hand. So we have made an accurate statement. But let's say we preparing a college paper after we conducted our experiment and our hand is no longer in the box - then we would want to say: "There was a transfer of thermal energy from system B (iron) to system D (hand). The heat from system C increased the temperature of system A by convection". Someone reading your paper may then ask "where did system C get that heat (thermal energy)"? In a way we are saying that there was thermal energy at that time flowing through system C derived from a different system that is relevant to the discussion.